Among his friends, Uncle Tai Hai is known as the ‘sek sun’ (eating god) of Penang. When I was at the island with rif and the in-laws in April this year, he took us to some pretty good food places – including the oyster noodles in Sin Lean Heang and Nyonya food at Nyonya Breeze. In those two days, we ate plenty and well. 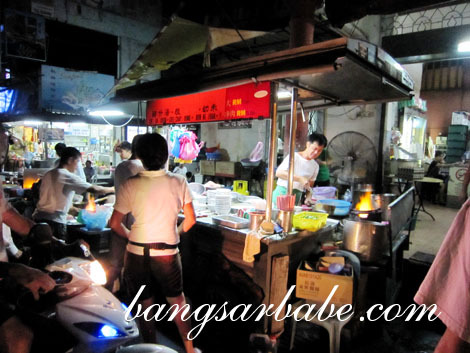 It was during dinner at Nyonya Breeze that he suggested pork porridge (bak moi in Hokkien) for supper. “It’s different from the one you get in KL. I’ll order some loh bak too. You’ll like it,” he insisted. 10 minutes later, we were in front of Ho Ping Coffee Shop in Kampung Malabar. 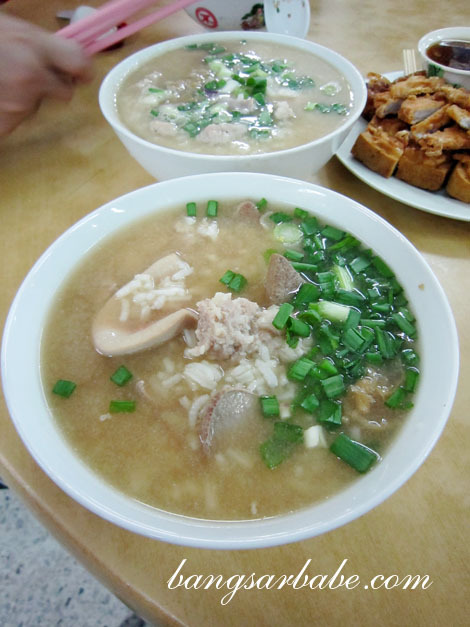 Uncle Tai Hai ordered two bowls of porridge – one with pig brain and one without. Apparently, the pig brain is said to be high in cholesterol and good for the human brain. I couldn’t bring myself to eat it, so I guess I’ll never be a genius. 😕 Jokes aside, the porridge was delicious. It was deeply flavoured by the minced pork and innards. The meat was tender and well-seasoned, adding more oomph to the porridge. 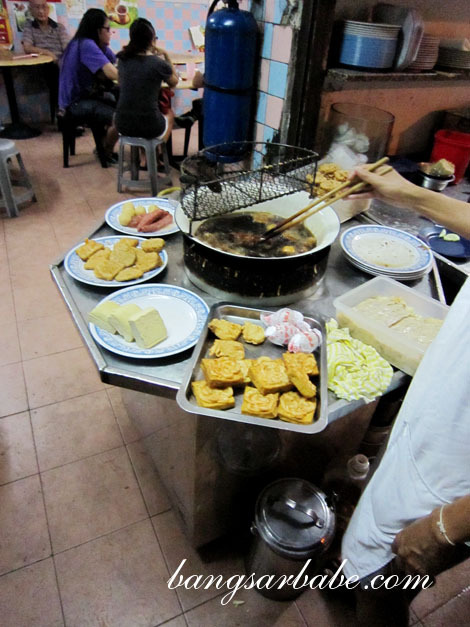 The loh bak – a deep fried snack of pork rolls, prawn fritters, fish fritters, beancurd and sausage – here is really quite good. ‘Lor’ stands for sauce, while ‘bak’ is meat. I liked this better than the loh bak at Kheng Pin, which I got to try during my Penang eating spree two weekends ago. It came with two sauces; chili sauce and a starchy sweet sauce with egg swirls. My favourite was the pork roll, seasoned with five spice powder and wrapped with thin beancurd skin. Also good was the prawn fritters – crisply fried with a generous amount of tiny prawns. Despite being full from dinner, rif and I greedily cleaned the entire plate in less than 15 minutes. Next round, I’ll be sure to order the pork porridge without pig brain and two plates of loh bak so we don’t fight for the last piece. Verdict: Very porky pork porridge and deeply addictive loh bak. Pork porridge… really looks yummy.. ..
Pork intestines is one of my fav..
Pork brains…I will pass on that but I will eat the rest! Lol! 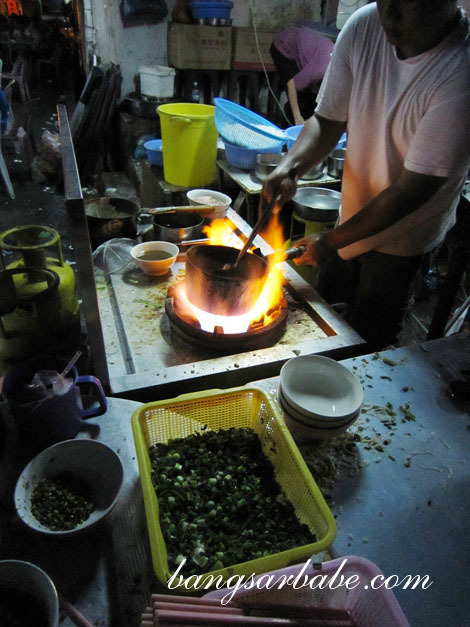 Penangites can win Fear Factor anytime! !